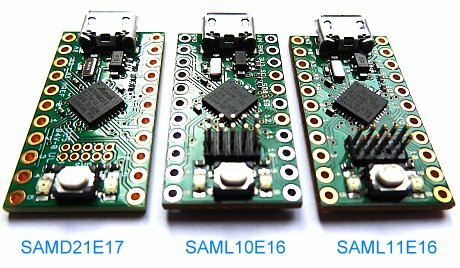 Looking for a first small board for the Microchip/Atmel ARMv8-M Cortex-M23 SAML10 and SAML11 I noticed the "almost 100%" pin compatibility with the SAMD21E17 on my Rabid Prototypes TAU boards. 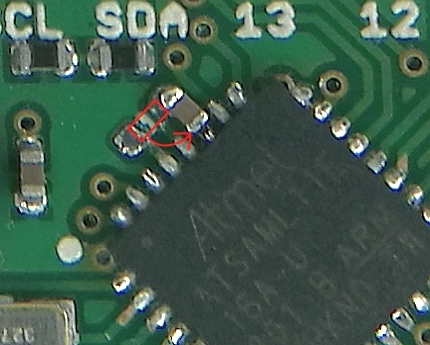 A closer inspection revealed only a minimal difference in subsequent pins. 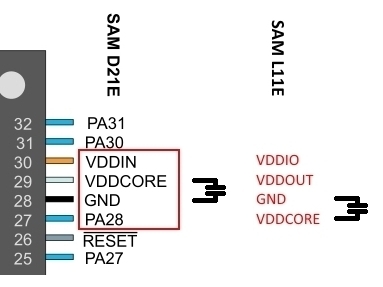 Of course the pin-mux table is not completely identical, but it is enough for SPI, I2C etc ... Only the two "NOT" USB-pins PA24/PA25 are lost and should not be reconfigured. But after replacing the processor and "turning" the capacitor C11 (PA28 is no longer there, but was not used anyway) run both boards, one with SAML10 and one with SAML11 properly. Just to test the low-power mode, an inductance L of 10µH between Pin29 and Pin27 would be necessary.